Browse our sell sheets for more information on our popular products. All-in-one drop measuring and dispensing solution. One product orifice and one air orifice allow hydro-static action to transfer the product from the bottle. The improved drop dispensing technique provides an alternative to standard eye dropper pipettes. The perfect match for EuroDrop caps and inserts. 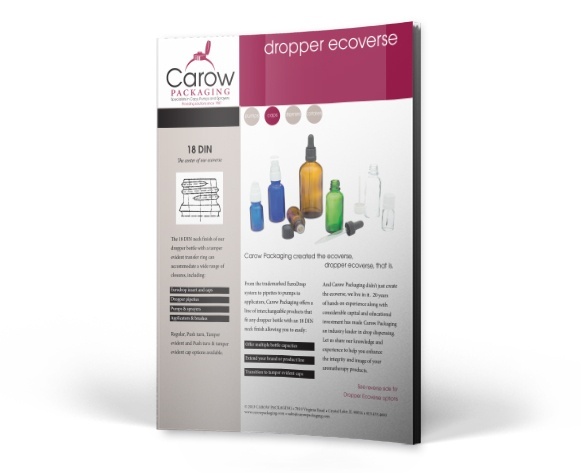 Carow dropper bottles have an 18 DIN neck designed to accommodate EuroDrop caps. 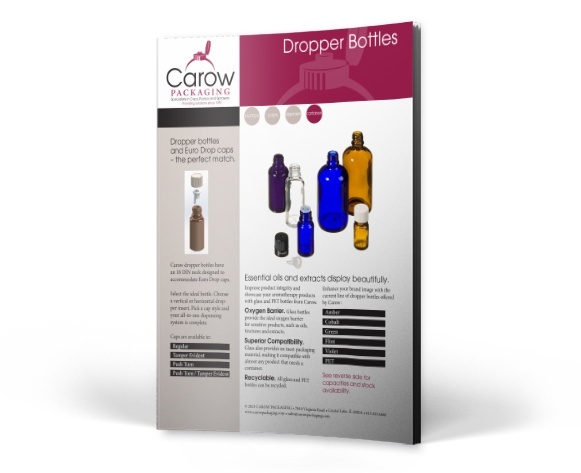 Select the ideal bottle and choose a vertical or horizontal dropper insert. A practical choice for controlled dispensing. Wide user acceptance makes a Dropper Pipette a practical dispenser. A huge selection of bulb & pipette materials, cap styles & deco options ensures the ideal dispenser is available for your package. Fit any pump to any jar. The versatility of the Adaptor Cap allows for unlimited choices of closure, size, shape and finish. 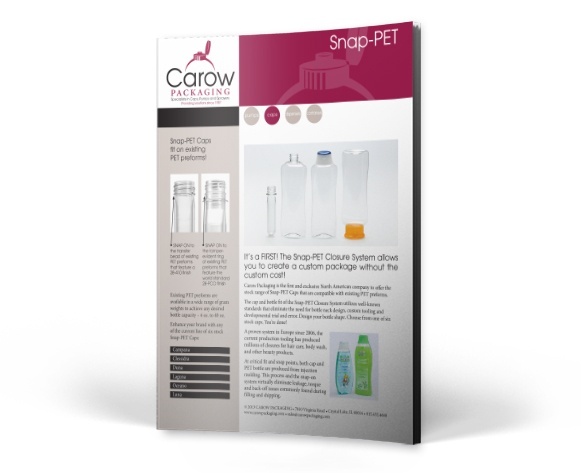 Add a pump and jar from Carow’s vast product line to complete the package. Create a custom package without the custom cost. SnapPET caps are designed to snap on to the neck of industry standard 28-PCO and 28-410 preforms. Eliminate the time and expense of custom tooling, bottle neck design and developmental trials. How do your customers dispense their e-juice? 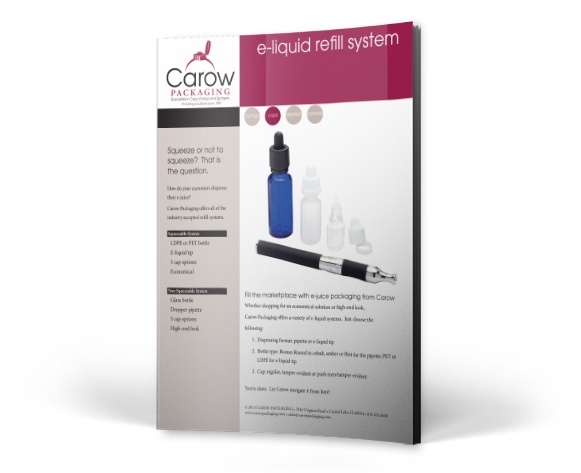 Whether shopping for an economical solution or high-end look, Carow Packaging offers a variety of e-liquid systems. 18-DIN: The center of our ecoverse. 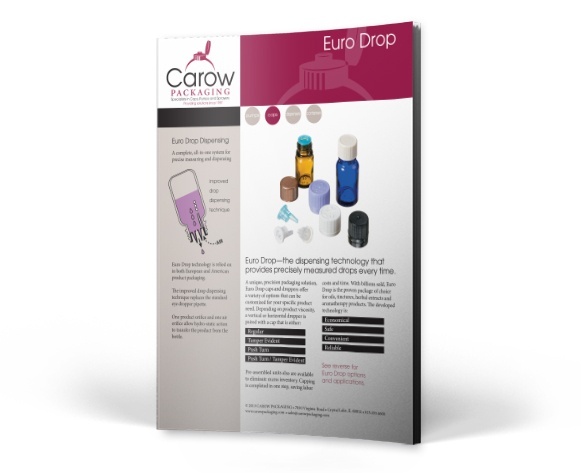 From the trademarked EuroDrop system to pipettes to pumps to applicators, Carow Packaging offers a line of interchangeable products that fit any dropper bottle with an 18 DIN neck finish. 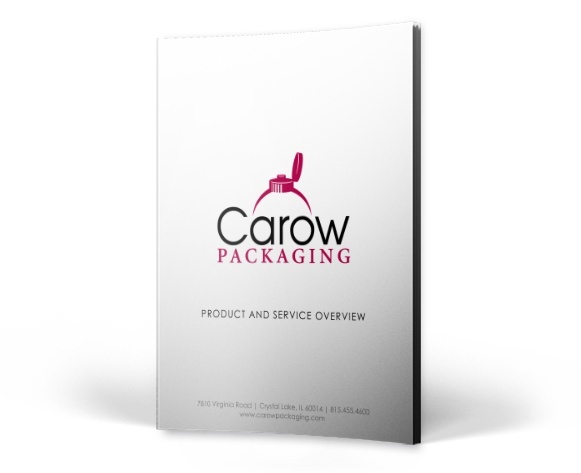 Carow Packaging is proud to be a market leader in a number of industries. 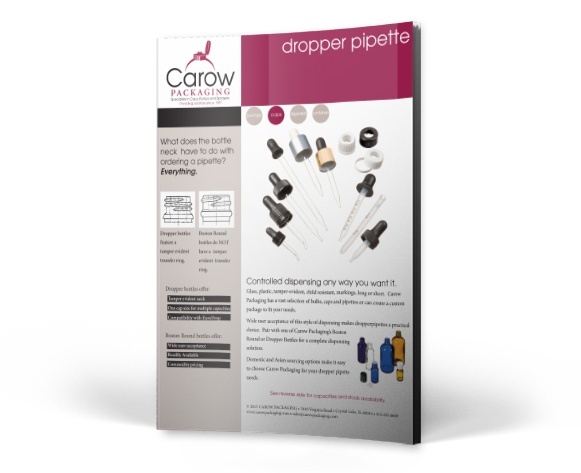 View our Corporate Catalogue to view all of our products and markets served.